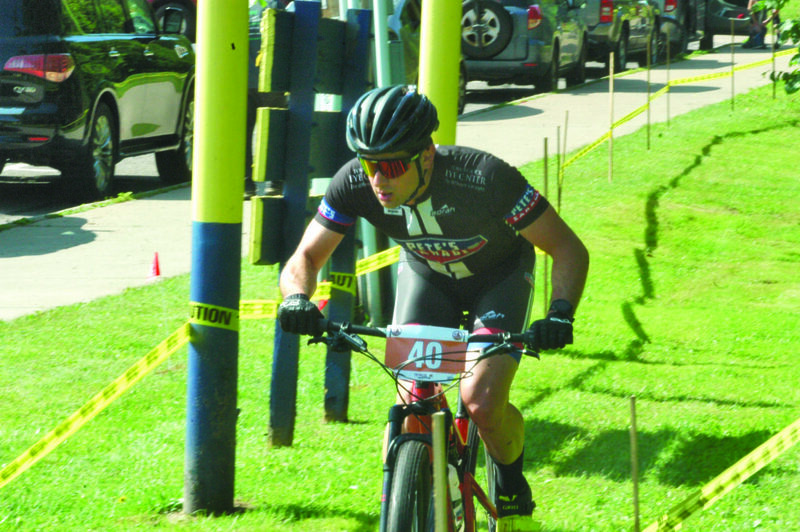 NEGAUNEE — Roughly 145 participants embarked at Jackson Mine Park in downtown Negaunee Saturday morning for the sixth annual Red Earth Classic mountain bike and trail running race. The main event of the day was the Beast mountain bike race, a 32-miler that challenged riders on a winding course through trails in Negaunee, Ishpeming and everything in-between. 27 riders registered for the Beast race, which began at 9 a.m. Tristan Schouten of Plymouth (Wis.) crossed the line first to claim the overall victory with a time of 2:31:13. Sarah Kylander-Johnson out of Duluth (Minn.) was the first female to cross the line with a time of 2:53:35. Schouten said technical changes to this year’s course made the race fun for him. Schouten defeated second-place finisher Adam Swank from Duluth by almost four-and-a-half minutes and said he created that gap just beyond the halfway mark on an elevation change in Ishpeming. Swank had a time of 2:35:40 while Scott Kylander-Johnson also from Duluth rounded out the podium at 2:36.58. Despite a challenging, technical course with roots, rocks and several elevation changes, the biggest obstacle for Scott Kylander-Johnson weren’t any of those. Instead, he encountered some horses. Other than the unexpected and humorous encounter, Kylander-Johnson said the trail was perfect. As for Kylander-Johnson’s wife Sarah, she took the female crown as previously stated beating out Andrea Newby of Hurley (Wis.) at 4:15:25 and Sonny Klipp of Janesville (Wis.) at 4:32:01. Kylander-Johnson said she enjoyed the technicality of the course. “The course was really hard,” she said. The first local finishers in the 32-miler were Brice Sturmer of Marquette, who finished eighth on the male side with a time of 3:10:43. Avery Evans of Ishpeming finished fourth in the female division at 4:46:08. Other biking events of the day included the 20-mile Loader race and 12-mile Doxer race. Kirk Harger of Munising finished first overall in the 20-miler clocking in at 1:27:34. Mike Paternoster finished second while Marquette’s Jim Argeropoulos finished third. The female side saw Bethany Aebli of downstate Grand Haven come in with a time of 1:41:39. Marquette’s Emma Stahl was second, while Rhonda Lassila of Wetmore finished third. Lucas Basal of Marquette came home first overall in the 12-miler, while Meilee Evans of Ishpeming took the female title. The running events of the day included a half-marathon, 5K and 10K, as well as a 5K walk. Tyler Gauthier won the half-marathon with a time of 1:04.53. The 10K’s only entrant, Ericka Asmus of Marquette, earned a time of 1:12:46. Harger won the 5K run while no entrants were recorded for the 5k walk. Kids biking and running races were also held. Race co-organizer Justin Koski called the event a success and no issues on the course were reported. “We had a really smooth, safe morning,” he said. “We’ve had no problems. It’s a challenging course, especially the 32-miler. We had a lot of people doing it just to sort of complete it, not necessarily be the first to complete it.